Guide Dave Camilleri leads a group of kayakers into Morro Bay on a morning cruise from the Kayak Shack at the Morro Bay State Park Marina. Looming to the left is the iconic Morro Rock, at the entrance to the harbor. To the right are the three smoke stacks that are landmarks for anyone who has visited the Central Coast city. 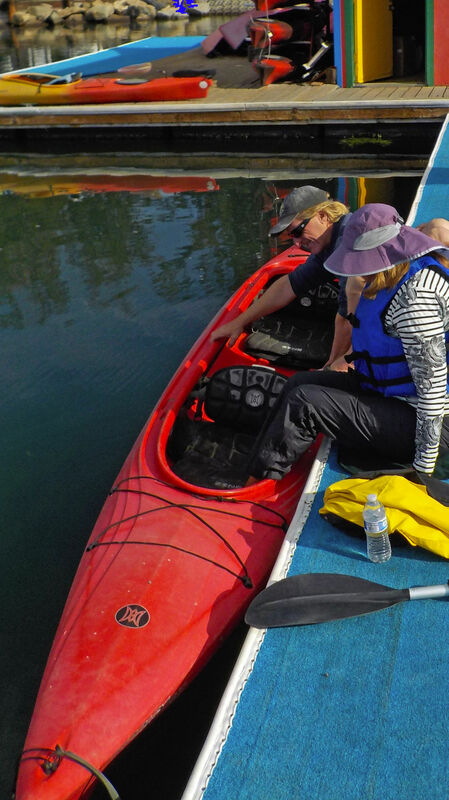 There is no graceful way for "newbie" boaters to get into or out of a kayak. But guide Dave Camilleri does his best to help. On 134 leased acres in Morro Bay, the family-owned Morro Bay Oyster Farm Co. raises Pacific Gold oysters and delivers them fresh to customers up and down California. Guide Dave Camilleri gives a few simple lessons to voyagers before casting off from the Kayak Shack at the Morro Bay State Park Marina for a morning cruise. Wildlife is abundant in the Morro Bay State Marine Reserve. This group of bay residents would rather sunbath than acknowledge the presence of a group of kayakers. Guide Dave Camilleri pauses to explain the wildlife and fauna during a recent kayak cruise in Morro Bay. In addition to conducting tours, Camilleri teaches environmental classes on the coast. You could feel a cold snap in the air — a reminder that fall and winter were just around the corner. But for Virginia Flaherty, the co-owner of Central Coast Outdoors, that is reason to celebrate. Fall and winter are her favorite months to go kayaking in Morro Bay. Well, actually, Flaherty insists there are no “bad months” to go kayaking in Morro Bay. In the fall and early winter, it’s still warm and clear, she told me as I booked a kayaking trip. She raved about the birding in November, the quiet time after the first of the year, and the year-round high temperatures off the Central Coast that hover between 60 and 65 degrees. Unless the wind is blowing or the rain is coming down in sheets, it’s a good time to go kayaking. As summer was closing out, I lined up on an early morning with a group of high school buddies on the pier at the Kayak Shack at Morro Bay State Park Marina. It was our latest effort to seek out adventure, without really risking life and limb. Only one of the five Class of ‘65 women had any real kayaking experience. But we were willing to give it a try if we could manage to fit into those little holes in the boats. I’ll get to the part about getting out later. Trust me, it wasn’t pretty. Central Coast Outdoors, one of several companies featuring kayak and boat excursions along the coast, offers three basic kayaking packages: the short paddle, 2.5 hours, leaves daily at 9:30 a.m., $60 for adults; the half-day classic, 3.5 hours, leaves at 9 a.m., $70; and the sunset paddle, 3.5 hours, leaves between 2:30 and 5 p.m., depending on the predicted sunset, $85. The departure times are posted on the company’s website, centralcoastoutdoors.com. We chose the short paddle because we are basically cheap and we were a little skeptical of the kayaking experience. Besides, we figured we would be done in time for a late lunch and wine at any one of the many fine restaurants in Morro Bay. Dave Camilleri, our guide and the man who promised to bring us back alive, greeted us at the water’s edge. Reared as a military brat, who traveled the world with his U.S. Navy father, Camilleri oozed the confidence of someone who had been around boats all his life. He lives with his wife, Margo, and their young daughter, Jessica, in Morro Bay. When he isn’t surfing or guiding kayak trips, he teaches environmental classes. He knew his stuff when it came to explaining the birds, wildlife and fauna we encountered as we paddled around the calm, protected bay waters. But first, Camilleri strapped on our life jackets and instructed us on how to paddle. It was a quick-and-dirty lesson, with more on-the-job training to follow once we got into the water. Camilleri patiently helped us fold our creaking old bones into the boats, cast off and form an armada at sea. Okay, we really were just four cigar-shaped boats following Camilleri like a mother duck and her clueless babies. It wasn’t the first time I visited Morro Bay. Some 50 years ago, my husband and I honeymooned in Morro Bay. In the years that followed, it was our favorite escape from the valley’s oppressive summer heat and depressing winter fog. But it was the first time that all those small dots of activity seen from the shore — the fishermen, birds and seals — were brought up close and personal, and at eye level. You really have never seen Morro Bay until you have seen it from the cavity of a kayak. Morro Bay, an estuary of wetlands, where coastal streams meet the ocean, is a designated state and national bird sanctuary. In 2007, it was further designated by the California Fish and Game Commission as a marine protected area and named the Morro Bay State Marine Reserve. It is home to an amazing diversity of wildlife, including sea otters, harbor seals, sea lions and steelhead trout. But its birdlife is simply spectacular. On a summer day, a visitor may be treated to the spectacle of a flock of white pelicans, with their wings folded back, plunging in formation into the water to pluck out fish. Snowy plovers, great blue herons, egrets and peregrine falcons that are in abundance are particularly on display during the winter, when migratory birds make Morro Bay their temporary home along the Pacific Flyway. As we cast off from the pier, our flotilla headed toward Morro Bay’s two iconic landmarks: Morro Rock and the three now-still smokestacks that tower over the town. Morro Rock is an approximately 580-foot-high volcanic plug that stands at the entrance to the harbor. Considered by American Indian tribes to be a sacred site, it was quarried for nearly 100 years for its rocks to build breakwaters and harbors. After ownership was transferred to the state, Morro Rock was declared in 1968 to be a California Historical Landmark. The smoke stacks, which some locals call “Three Fingers,” were built in the 1950s with the adjacent power plant that provided energy to the Central Coast and the Central Valley, including to Fresno and Bakersfield. Ownership of the plant has passed from Pacific Gas & Electric to Duke Energy and then to Dynergy. However, plans to modernize and restart the plant have stalled. On the first leg of our cruise, our kayaks hugged the shoreline, allowing us to slide by an assortment of homes and businesses, and to weave around several “working boats” that between fishing trips are claimed by pelicans and other creatures. After about a half-hour, we turned into the center of the bay and toward a strangely angular platform. As we drew closer, the words “Morro Bay Oyster Farm” came into focus. On 134 leased acres, the family owned company raises Pacific Gold oysters and delivers them fresh to customers up and down California. In this video, the company explains the process and why Morro Bay is uniquely suited to producing these oysters. After a few minutes of bobbing around the “farm,” we turned once again and headed to a collection of coves and a sandspit that were clearly the domain of some of Morro Bay’s most famous residents — sea lions, otters and, yes, many more birds. While most of the critters tried to ignore us, hoping we would just go away, several floated out and popped their heads up for a look next to our boats. They seemed to be urging us to move along, which we did after we were through taking photos. It was time to head back to the Kayak Shack. By now, no one was really anxious for the trip to end and we all worried about how we would get out of the boats. One-by-one, Camilleri gave us a yank and heave-ho’ed us onto the dock. We landed with less finesse than dead fish tossed from a boat. But with the glow of good memories and abundant chardonnay, the humiliation was soon forgotten. Dianne Hardisty retired as The Bakersfield Californian’s editorial page editor. She can be reached at dhardisty123@gmail.com. Cost: Short paddle, 2.5 hours, leaves at 9:30 a.m., $60 for adults; the half-day classic, 3.5 hours, leaves at 9 a.m., $70; and sunset paddle, 3.5 hours, leaves between 2:30 and 5 p.m., depending on sunset; $85.